At every level of Nigeria's educational system, there are certain "hiccups" that prevent students from gaining admission to school. 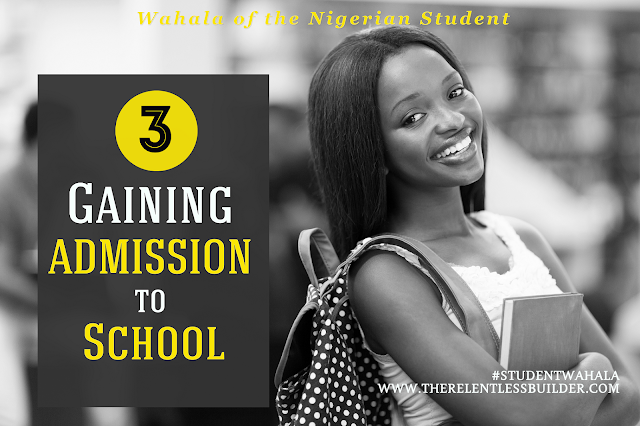 I wanted to discuss them briefly in Part 3 of our ongoing series, Wahala of the Nigerian Student. I think that at this level, the single most important barrier to admission is money. Pure and simple. Why? Because the parents will send the child to a school they can afford. Since there is no entrance examination for nursery and primary schools, and assuming that most parents want to send their children to private schools at this level for obvious reasons (See Part 1). If parents can afford the expensive school fees many of these schools ask for, in exchange for their version of a quality education, then there is no problem. Unless, of course, the school is in such high demand that there is a waiting list. Even with that hurdle, money will decide whether a child attends a particular school or not. If you can afford to pay the school fees, you can most likely pay for the after-school lessons, which most Nigerian children attend. It's as if what is taught in school is not enough. You still need a lesson teacher to give you another dose of algebra, etc. Now, this is where things start heating up. Before gaining admission into a Nigerian secondary school, a child has to pass the Common Entrance Examination. In addition, some schools have their own additional exams or tests (private schools, especially) which a child has to pass before being admitted. But, that's not all. There is also an interview. No, not a job interview. Truthfully, I have no idea what the purpose of the interview is. Some schools demand it, but others don't. I remember it was optional for my secondary school. Ideally, once a child scores above the "cut-off" mark on the entrance exam, that should automatically secure his or her admission. But, we are talking about Nigeria here, so it is not that simple. It is indeed common, especially in schools (e.g. federal government colleges) that are well-known and are in high demand due to some past glorious standard (think Queen's College, King's College) for students who scored nowhere near the cutoff point to land a coveted seat in these schools. How? Well, what are parents for? If your parent has connections and can pull more than a few strings (or in some cases, can succeed in bribing, begging and resorting to just about anything you can imagine) to make sure their child gets into a particular school. So, in the end, gaining admission has less to do with what your child scores, and more to do with who you know and how much power that person can wield. Mind you, the same thing goes on here in America with private schools that are in high demand, so this is not a Nigerian thing. If you read the true story of my own JAMB experience, you should have an idea of what gaining admission to higher institutions in Nigeria is like. Of all the three levels of education, I would say this is the absolute worst with respect to admissions. It can literally turn to a nightmare. Ordinarily, you should be able to get into a university of your choice after scoring above the JAMB cut-off mark for your particular course of study (each college or department has its own cut-off mark), and making the appropriate WAEC/NECO/GCE grades. However, it is not that simple. The deep-rooted corruption in Nigeria's political system has affected the educational system as well. It is no longer enough to make the right score or pass exams successfully. If you got into university that way, Congratulations! You are one of the lucky few. There are countless others who have to re-take JAMB year after year just to study a 4 or 5-year course. Some people pass the exam, but don't make the required score to get into a particular course, so the university offers them less desirable courses like history or geography as opposed to say law, medicine and engineering, which most parents push their children to pursue. It is when it comes to university admissions especially, that who you know or how much money your parents have matters. Money truly answers all things. This is mostly a public school issue at this level, as private universities have provided an alternative to public/government-funded universities. However, private schools are not cheap and some of them are considered to be glorified secondary schools because of the rules and restrictions imposed on students. Let me conclude this post by saying this: That old man who preys on JAMB students represents the hopelessness that has become synonymous with university admissions. I have seen many of my friends grow from teenagers to young adults, while waiting to get into school. It's really pathetic. How will they redeem those wasted years? What do you think of the admissions process in Nigerian schools? Good, bad, let's hear it.